You love your friend, but she’s going through a rough breakup. You want to help her, but she’s overwhelmed by her emotions. Here are 10 tips to share with your friend to help her find a positive path through her breakup and get back to being her gorgeous, fun-loving self again! You will be happy again. Never doubt it. Millions of people separated before you and have also succeeded. Positivity and power are your words! I am 100 percent responsible for my life. No one else is responsible for me. I am not a victim – not of my ex, and not of my situation. I will approach today in a positive way, no matter what happens. I will take care of myself so that I can be my best self. There is one person you should love more than anyone else―and that is you! Give yourself all the love and care you deserve right now. Make yourself feel loved and happy, and the rest will fall into place. Your body is your friend. Listen carefully to the signals it gives you. Stress + negative emotions + physical illness = alarms! Eat healthily, get moving, and get enough sleep. Right now, your enemies are not your ex, the lawyers, gossipy acquaintances, or your ex’s new partner. There’s nothing you can do about them. Your REAL enemies are your own negative thoughts and behaviors, because they can derail you. So watch out for too much drinking, binge eating, spending too much time on your phone or laptop (social media stalking is a BIG no-no! ), and other impulsive behaviors. They might temporarily feel good when emotions are hot, but you’ll regret them in the end. Put a super-nice picture of yourself somewhere in your house. Give yourself healthy treats – like bubble baths, fresh food, massages, or long walks in the park. Do things that make you feel like you sparkle―even when you don’t feel like getting out of bed. Your ex’s stuff is full of bad energy right now. Give everything back to your ex within two weeks. Have a “purge party” if you want help from friends and family. Don’t keep things out of spite or stubbornness, or to try to manipulate your ex. What you put out comes back to you. Never engage in hate speech with or about your ex, aloud or online. Don’t email or text late at night, or when you’ve had too much to drink, when emotions are likely to run high. Give yourself time to process before you respond to any communication from your ex. 9. If you have kids, don’t bring them into it. It is never your kids’ job to deal with your anger, sadness, and frustration with your ex. Don’t talk to them about your problems, and don’t ask them to be messengers. This can be seriously damaging for them. Your breakup isn’t a group effort; it’s between you and your ex. So focus on the fun memories from your shared past, and look forward to creating bright new memories in the future. Your friends can support you better when they know what you need, and how they can help. So instead of keeping it all inside, talk to your friends about how you’re feeling, and ask them to help you stay positive. Real friends will support you to take positive steps and get yourself out of the drama, instead of creating more. Bonus Friend Tip: Stay off social media! You don’t need to know what your ex is doing, and with whom. Focusing on your own life is the best way to start getting your groove back! Hint for sharing: Let your friend pick one, then do it together! Before going to sleep, put on your favorite happy song from when you were around 14-16 years old. Do you remember? Even if you do not feel like it, get the lyrics out and sing along, loudly! Write down two amazing things about your 3 best (girl)friends. Keep the paper in your handbag to remind you that you are loved and supported. If you want you can share your notes with them! 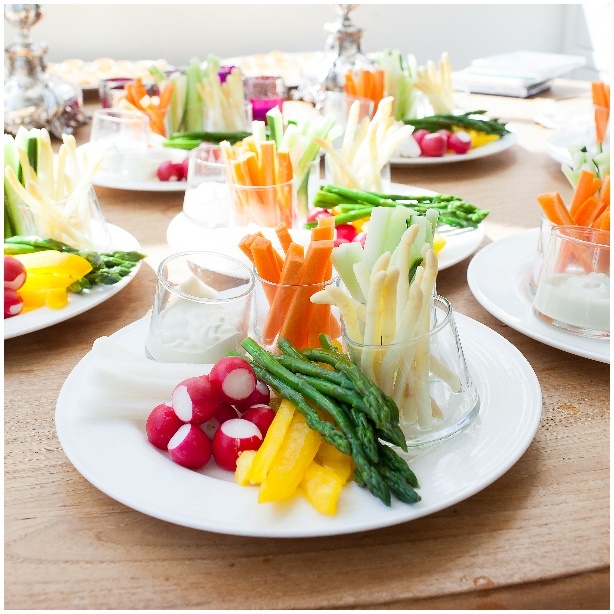 Make yourself a French crudité platter. Fun and healthy. Your favorite dip sauce might brighten up the plate. Older PostGetting Divorced? Bake a Cake!